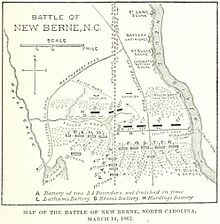 In August 2015, we shared the story of the first North Kingstowner to fall in combat in the American Civil War during the March 14, 1862 Battle of New Bern (also spelled as New Berne) in North Carolina. With the Varnum Memorial Armory Museum’s recent acquisition of artifacts relating to that battle, it seems like a good time to retell the story of young Charley Baker and include a little about another North Kingstown man who died in that same encounter with North Carolina Confederate forces. In a quiet corner of North Kingstown’s Elm Grove Cemetery is the Baker family plot. Among those buried under a simple, moss-encrusted marker is Charles Cahoon Baker, who is said to be the first North Kingstown resident to die in battle during the U.S. Civil War. Charley was a member of Company H, 4th Rhode Island Infantry Regiment part of the forces under command of then Col. Ambrose Burnside sent to capture the important fortifications that guarded key transportation lines used by Confederate forces. While Charley was not the first Rhode Islander to die in the war, his story is eminently representative of the horror of battle and the sadness of its aftermath. 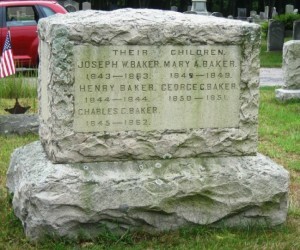 Charley Baker was born in Wickford in 1845, the third of nine children of David Sherman Baker and Mary Cahoon Waite Baker. He grew up in the family homestead at 50 Pleasant Street (the house, still standing, was built in 1785 by Benjamin Lawton Packer and sold to Charley’s grandfather in the 1830s). When Charley’s mother and father started growing their large family, the house quickly was expanded and took on its present appearance around the time of the American Civil War. The Bakers were prominent local residents, members of the First Baptist Church and a family of strong patriotic principles. 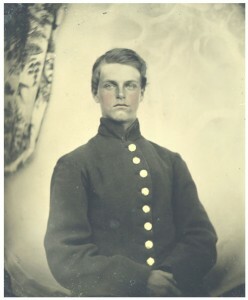 No one was surprised when Charley, who had just turned 17, was among those young men who rushed to Providence, RI, to volunteer as a private in the Grand Army of the Republic in September of 1861. Charley and his fellow volunteers left Rhode Island for Washington, DC on October 2. After training, they were attached to the Army of the Potomac and in early January of 1862, under the command of General Ambrose Burnside, they were sent to North Carolina, seeing service at the Battle of Roanoke Island before being sent on to New Bern. Let’s go back to that cold, damp and dark morning on the last day of young Charley’s life. 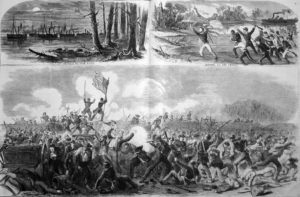 He woke from a likely fitful sleep after having landed with his comrades and marching through rain and mud to a campsite outside the Confederate-held Fort Thompson outside the city of New Bern. Shortly after dawn, gunfire broke out. 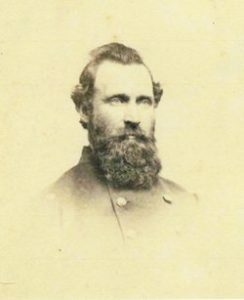 Colonel Isaac Rodman, a well-known Rhode Island banker and politician who later died at the Battle of Antietam, ordered his 4th Regiment, including Charley’s Company H, into a breech in the Rebel lines. Sadly, Charley Baker was not among those who made it to the fort. As he ran through the breech in the line, his last experience was likely a blinding flash and his war was over. He became the first of some 90 Rhode Islanders to die in that battle. Union losses also included 380 wounded and 1 missing. Confederate losses: 64 killed, 101 wounded, 413 captured or missing. As was the custom whenever possible, Charley’s remains were recovered and his body was brought back to Rhode Island 6 weeks after the battle. On April 26th, many in the town of Wickford gathered at the First Baptist Church to mourn with the Baker family and also with members of the family of 32-year old Sgt. George H. Church, Jr., another North Kingstown man who died during at New Bern. His body was returned for burial along with that of Private Baker. 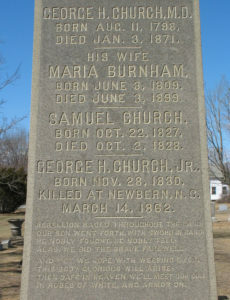 George was the only surviving child of Dr. George Church and his and his wife Maria Burnham Church. A son named Samuel had died just short of one year of age in 1828. Sgt. George Hazard Church, Jr. Rebellion raged throughout the land. Our son went forth with sword in hand. He nobly fought. He nobly fell. And yet we hope with weeping eyes, this body glorious will arise. Then safe in heaven we’ll meet our son in robes of white, and armor on. The funeral service for the two men was described as the largest of its kind in the town’s memory. The procession from the church to the Oak Grove Cemetery on Tower Hill Road was nearly a mile in length. The caskets were carried on carriages from the Narragansett (Fire) Engine Company, of which both men had been volunteer members. The two soldiers were laid to rest in their respective family burial sites. (Author’s Note: Actually, the first Rhode Islander to die in the U.S. Civil War was Pvt. Henry C. Davis of Woonsocket, RI. A member of Co K, 1st Rhode Island Detached Militia, he died of typhoid at Camp Sprague in Washington on June 16, 1861, 5 weeks before the First Battle of Bull Run. He was buried in St. James Cemetery in Woonsocket, RI). One hundred and fifty seven years ago in March of 1863, a young man from North Kingstown, RI, along with a fellow soldier from the same town, gave his life in a brief and violent moment in the honorable service of his country. They were among more than two thousand Rhode Islanders to die in the Civil War. The motto of the Varnums, “To Encourage Patriotism”, reflects their memory and all who have gallantly served our nation through the years.